Haha! You’re probably expecting a blog about ringtones! This appealed to my strange sense of humour. Who needs ringtone soup? You can’t eat it can you? So here are my favourite soup recipes. It’s an odd assortment and some of my recipes are sort of throw-it-together because I’ve made them so many times I’ve never followed anything written down. I love to use lots of different vegetables in most of my soups, so just go with the flow, experiment, add whatever you have in the fridge or cupboard and enjoy. Oh and a shout out to the guys I think offer the best electrical services in Horsham for helping me get my new cooker installed and up and running. Without them I might still be sharing my recipes, but I wouldn’t be sharing any soup! And just so you know, I’m useless at photography and this isn’t supposed to be a recipe book as such, so I’ve snagged some pictures off Google (only those labelled available for reuse!). It just makes the blog look more attractive and I’ve looked for photos that closely resemble my recipes. Confession over! This is what I call Builders Soup because it’s a hearty and warming meal for those who’ve been out building or working in the fields all day. And I dedicate it in particular to our good friend James who’s just retired from the building profession. Hearty Builders Soup contains both beef and vegetables and should see any manual worker through the day! This makes a big batch that you can keep a couple of days or freeze – or have for a winter party. Bring to the boil and simmer for at least 2 hours. Remove meat from the bones if appropriate and skim off excess fat. And there you have it. Hearty Builders Soup (or casserole if you like!). Good enough for a winter party and sustaining enough for the hungriest of builders! 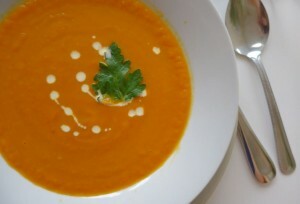 Here’s a nice soup for the summer – shouldn’t be too long now! Of course you can mix and match all sorts of fruits to make this delicious soup. Experiment with fruit from your garden. I’ve found that the sweeter fruits work best. If you’re using gooseberries (sweet varities), or something else with a tougher skin, cook those first as described and just add the softer fruits at the end. Then anything too hard will be seived out. This is a refreshing dessert and an unusual treat for your guests, who probably won’t be expecting you to serve soup for pudding! Add to the pan the peels, plus half the strawberries, raspberries, pineapple and mango and continue sauteeing for another 3 minutes. Add the water, sugar and juices to the pan, stirring until the sugar dissolves. Bring to a gentle simmer and continue for 5 minutes. Remove the pan from the heat and leave it to cool a little, since sugar mixtures can get very hot. 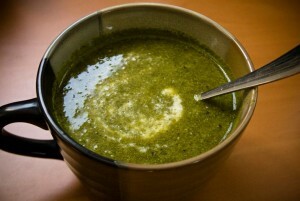 Using a stick blender, puree the mixture, then seive the soup into a bowl. Add the remaining chopped fruit, stir well, then chill. You can add fresh mint sprigs if you like to decorate. Serve with clotted cream or really thick home-madeGreek yogurt, and finish with brandy snaps or cinnamon tuilles. It’s making my mouth water just writing out the recipe! Now I know cloud bread isn’t a soup, but it is an accompliment and one that goes very well with my low-carb diet. Of course it’s not really bread, but it is great with soup or to make sandwiches when you can’t find anything that doesn’t contain heapings of carbohydrates. Cloud bread seems all the rage this year and I can understand why. One piece of cloudbread contains around 45 calories and I think it’s delicious when you add a handful of cheddar. Eat immediately for crispy cloud bread or leave to cool, when they go quite soft. 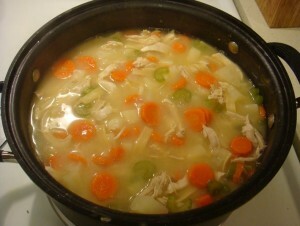 Vegetable soup is delicious and the taste varies every time you make it. You may recognise some of the method from my chicken soup recipe, and really it’s similar to make but tastes completely different. Give it a go. You can choose whatever vegetables you like. I usually add some of the following: carrots, potatoes, squash, sweet potatoes, celery (not too much), courgettes, sweet peppers, spinach, cabbage (not too much), turnips, swede, peas, mushrooms – anything in the fridge! Don’t add too much of the strong-tasting vegetables or they may overpower everything else. I don’t add tomatoes to vegetable soup, but if you want a completely different taste, add a tin or two of tomatoes and some tomato puree. 1. Wash or scrub your vegetables, remove cores, etc, and chop into large pieces. 4. Remove from the heat and use a stick blender until it’s the consistency you want. You can leave small or largish chunks or completely puree the soup. 5. Put the saucepan back on the cooker and heat through. Season to taste, adding more stock cube if necessary to bring out the flavour. This makes a very simple but delicious and nutritious soup. 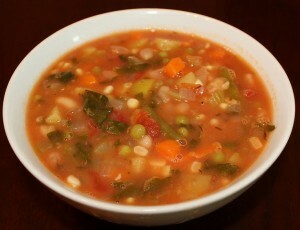 In fact it’s making my mouth water and I’m off to scour the fridge and make some vegetable soup right now! We all know how healthy spinach is – full of iron and vitamins, it’s a true super food. But not everyone likes the taste when presented as a vegetable, so this is a popular alternative with my family at least. Melt the butter and fry the onions gently until soft, not brown. Add the potato and chopped garlic and cook for a few minutes, stirring occasionally. Add the stock, bring to the boil and simmer for 10-15 minutes. Add the spinach and simmer for a further 10 minutes. I love to make this when we’ve had boiled ham. If I don’t want to make the soup immediately, I boil the water rapidly once the ham has been removed, condensing it down to a much smaller amount that can be easily frozen. You can also freeze a piece of the ham so it can be added back to the soup. This is one of those soups where I just throw everything in so I don’t have exact amounts. Basically you just chuck it all in together and cook for an hour or so until everything is soft. You can also add wine or beer if you like. Then remove from the heat and blend with a stick blender until it’s the consistency you require. Sometimes I make it almost pureed and other times I leave a much coarser texture. Experiment. It’s delicious either way. Reheat if necessary, adjust seasoning and if it’s too thin just keep it bubbling away until it’s reduced to the required thickness. We have this as a main course for dinner (probably two bowls) or a lovely warming lunch. I make my own Greek yogurt every day. This soup is made extra-special by adding a good spoonful of the thick tasty yogurt into each bowl. But you could use cream or crème fraiche – or just eat as it is. 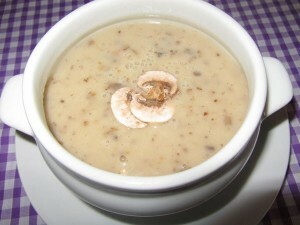 We like this soup served with a soft roll – somehow it seems to go with the delicate taste of mushrooms. 300-400g mushrooms – a mixture of types or wild mushrooms give the best flavour. 1. Melt the butter in a large pan and gently fry the leeks and garlic until softened. 2. Add the thyme leaves and mushrooms and fry over a higher heat for about 4-5 minutes. 3. Add the stock, bring to the boil and simmer gently for about 10 minutes. 4. Remove from the heat, allow to cool slightly, then blend with a stick blender until smooth. 5. Serve and voila. Add yogurt, crème fraiche or cream as required – see above – to give a luxurious creamy finish. This is a lovely smooth, warming vegetable soup. Find some really nice crusty farmhouse bread – or make your own. A small portion makes a great starter for a dinner party, or a large bowlful or two will make a warming winter meal. Another easy soup, but delicious. 1. Place the carrots and sweet potatoes into a large roasting tin, drizzle with olive oil, season and roast at 200 degrees for around 25 minutes, until caramelised and soft. 2. Meanwhile fry the onion in a little olive oil on a medium heat until softened – about 10 minutes. 3. Add the garlic to the pan and stir for around a minute, then add the stock (if using stock cubes, dissolve them in a litre of boiling water first). 5. Blend with a stick blender until silky smooth. 6. Add the crème fraiche, check seasoning, and reheat. 7. Serve and swirl with a tablespoon of crème fraiche in each bowl. 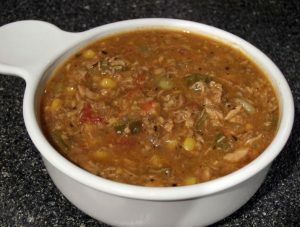 I’ve been making this soup for years, especially at Christmas and Easter when we always have a large turkey carcass left over. Everybody loves it and it makes a very hearty meal with a roll or thick slice of bread. It’s really easy, though taking the meat off the bones is a bit messy. Never mind, hands are washable, or if you’re really fussy you can wear clean rubber or latex gloves. 1. Using your largest saucepan, squash the carcass in as much as possible. If you have a large turkey, you may have to do two lots. Cover the carcass or thighs with plenty of water and bring to the boil. 2. Simmer, covered, for at least an hour, until the carcass is falling apart and the meat is easy to remove. 3. Remove the carcass and put aside to cool. 4. Strain the liquid through a sieve lined with muslin or a clean tea towel, or if necessary use paper towels. This will help to remove some of the fat and will catch any small bones or bits of gristle. 5. Pour the strained liquid back into the saucepan. 6. Add chopped vegetables. You don’t need to be particular with this. Scrub the vegetables, top and tail if necessary and remove any nasty bits. Then chop roughly into large pieces and drop into the liquid. Use enough to just about fill the pan. 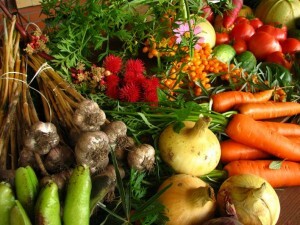 Use any raw vegetables you have in the house – for example, carrots, cabbage, potatoes, sweet potatoes, onions, peppers, tomatoes, mushrooms, squash, spinach, swede, turnips, celery, courgettes, peas etc. Adding tomatoes (especially a can of tomatoes) can change the flavour of the whole soup, so try with and without to see which you prefer. 7. Add a chicken stock cube and a vegetable stock cube and a good shake of Worcester sauce. If you like, you can add some leftover wine at this stage. Season with salt and pepper. 8. Bring to the boil and simmer until all the vegetables are soft. 9. Meanwhile remove all the meat from the bones. 10. Once the vegetables are cooked, remove from the heat and add the meat – leaving some of the smaller pieces if you prefer a chunkier soup. 11. If you have any leftover cooked vegetables, you can add these just to thoroughly theat through before the next stage. 12. Using a stick blender, blend the soup until it’s the consistency you want. 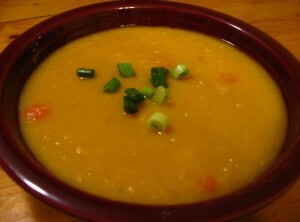 I prefer to leave some pieces of vegetable, but some people like a more pureed soup. 13. Taste and season as you like it. If it doesn’t seem to have enough flavour, add another half chicken stock cube and reheat. 14. And that’s it. Enjoy.